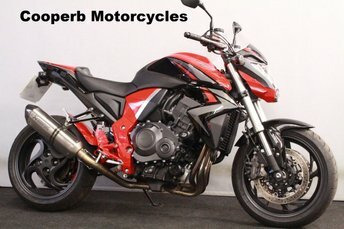 Discover the superb range of used Honda motorbikes for sale in Northampton today. A leading manufacturer of motorcycles since 1947, the Japanese firm produces a comprehensive range of bikes, including 125 and street models, through to touring, adventure and supersport versions. Here at Cooperb Motorcycles Ltd you'll find a great choice of quality used motorcycles, all competitively priced to suit a range of budgets. If you're in the market for your very first sports bike, such as the Honda CBR125R, or you're ready for the pulse-quickening power of the CBR1000RR Fireblade, we'll help you find the ideal motorcycle to suit your needs. Be sure to contact a member of our friendly team to find out more about the latest range of used Honda motorbikes for sale in Northampton.